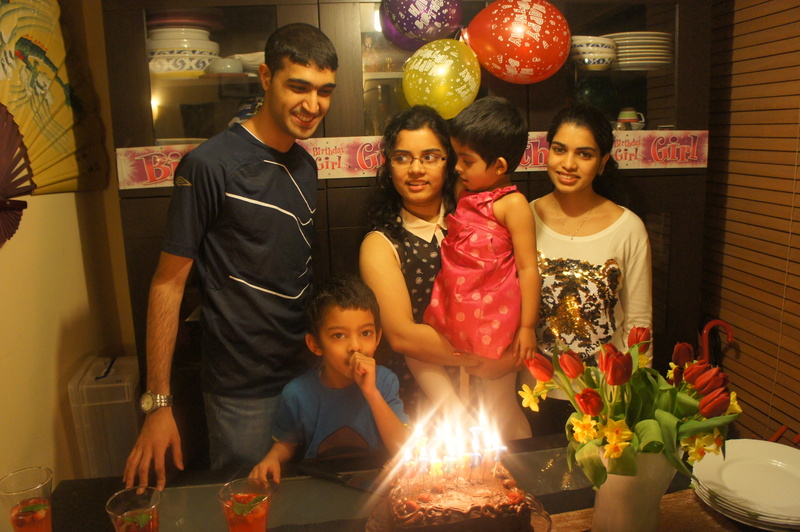 Nikhita’s 19th birthday dinner | Life's Conundrum - Eat to Live or Live to Eat? Cannot believe my little niece has just turned 19 – I can still remember holding her as a baby when I first got to Bahrain back in 1994. Anna and I selfishly offered to host a dinner for her birthday and invite a couple of her closest friends so as to ensure she was with us on her birthday. 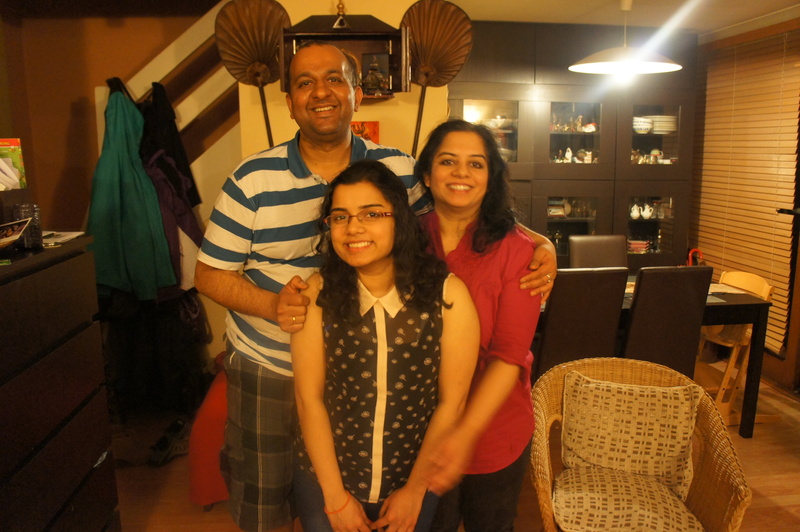 Nikhita fancied a Chinese meal and our challenge to create a cohesive menu began. We finally decided that it was going to be an all vegetarian affair as the majority and more importantly the birthday girl are vegetarians. Anna also made a wicked mocktail which looked pretty as a peach and tasted even better. I know chocolate cake is not exactly classified as a Chinese dessert but what’s a birthday party without cake! Here are a couple recipes if you are interested in trying them out. Place crushed ice on the bottom of the glass and pour rose syrup over it. Pour the cranberry juice first followed by the ginger beer. Garnish with chopped strawberries and mint leaf. Heat the wok till its hot. Add oil and garlic and stir rapidly (don’t want the garlic to burn and leave a bitter taste) for a minute. Add the red chilli flakes and stir for 30 seconds before adding the beaten eggs. Scramble the eggs and then add cooled cooked rice. Add salt, pepper, soy sauce and sesame seed oil and mix well. Add the spring onions and mix through. Switch off and serve hot. 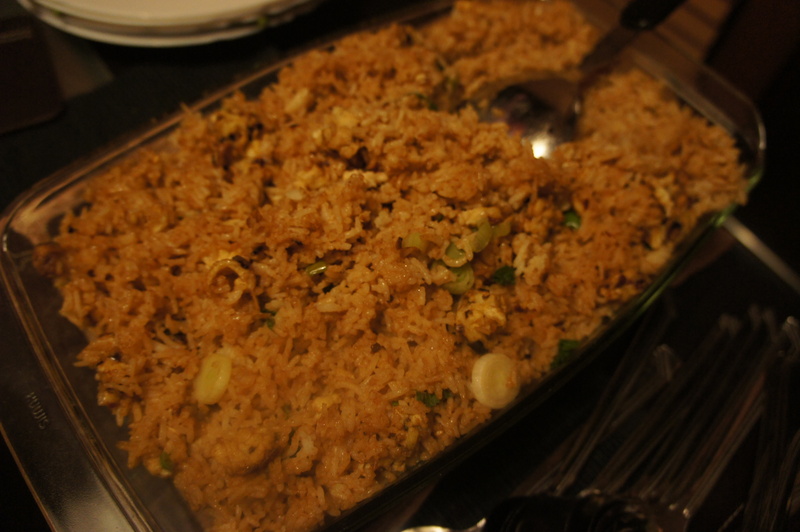 Posted on April 13, 2013 by Anna and Shiv	• This entry was posted in Hosting a meal, Main courses, Recipes and tagged Basmati, Chili pepper, Cook, Cranberry juice, Fried rice, Sesame oil, Spring roll, Wing Yip. Bookmark the permalink.